Nearly all the images in this post are clickable to see a larger version. As long as there has been a Jane Austen fandom, Janeites have been frustrated by a lack of good images of their favorite author. 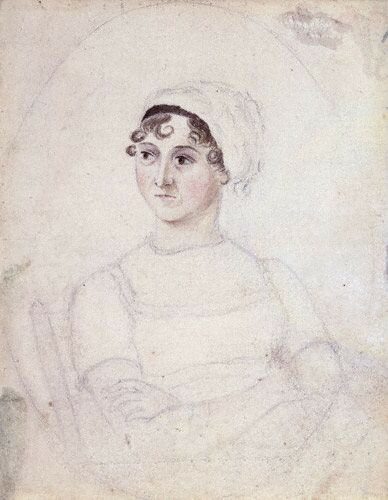 The only authenticated image of Jane is a small pencil-and-watercolor sketch done by Cassandra Austen, currently on display in the National Portrait Gallery in London. Many Janeites are dissatisfied with the watercolor: the colors are faded, and Jane does not look especially happy to be sitting for the painting. In our opinion, having seen the painting in person twice, we do not think photographs do it justice. The detail of the eyes and hair is quite good. Had Cassandra finished the entire piece in such detail, we would want no other image of Jane. 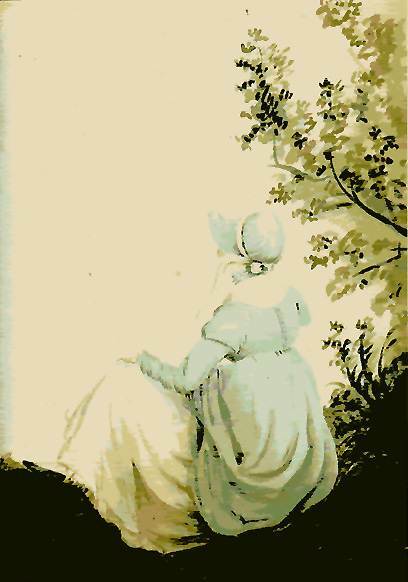 One of the best-known images of Jane Austen is the well-known silhouette found pasted into a copy of Mansfield Park, bearing the legend “L’aimable Jane” (the amiable/pleasant/nice Jane). We have always found this story a bit suspicious. It’s never been clear to us whose copy of MP contained this silhouette. If it belongs to a family member or close friend or even an old boyfriend, that makes it more likely to have been Jane, but why would a perfect stranger have a silhouette of Jane Austen in his or her book? How would he or she even know Jane’s name? Remember, she published anonymously. However, the silhouette is charming and we have no problem with it being a symbolic representation of the youthful Jane Austen. The silhouette is also owned by the NPG. Another painting by Cassandra is currently owned by an Austen family member. It shows Jane Austen sitting down and facing away. The painting is delightful, and only lacking in not showing Jane’s face. Another silhouette was considered by the Austen family to be of Jane Austen, but it has not been authenticated. 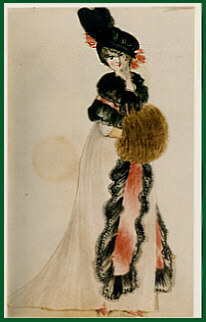 She is wearing a spinster’s cap, and the silhouette shows a nose that matches a silhouette of Mrs. Austen, but the watercolor portrait does not give Jane such an aristocratic profile. 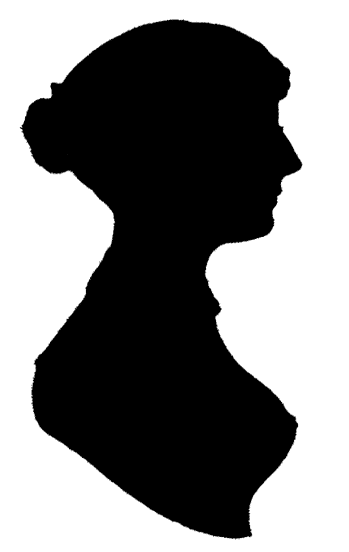 Deirdre Le Faye has suggested that this particular silhouette dates from Victorian times and is of a later Jane Austen. The so-called Rice painting is well-known and still associated with Jane Austen, and has been an object of contention in the past several years among Janeites and Austen scholars. The history of the painting is interesting. One of Jane Austen’s cousins gave the painting to a neighbor, who he knew was a fan of Jane’s work, and told her it was a painting of Jane Austen by Zoffany. 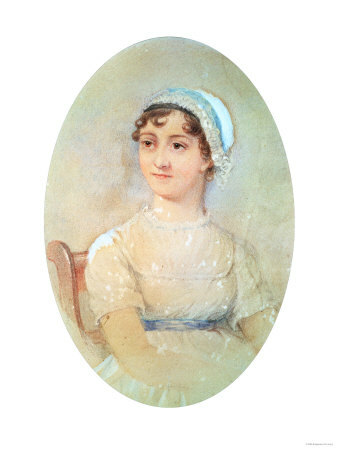 Until the 20th century, it was accepted as a portrait of Jane Austen as a young woman, and was included by Lord Brabourne in his edition of Jane Austen’s letters. 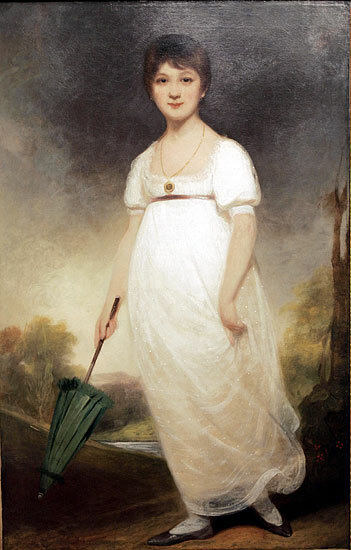 In the 20th century, the painting came under more critical scrutiny, and it was determined that Jane Austen would have been around thirty years old when the painting was done, obviously much older than the girl in the portrait; it has further been determined that the painting is certainly not by Zoffany but by Ozias Humphry. It has been suggested that the painting was of another Jane Austen, a cousin of the authoress, and that the painting was mistakenly gifted on a misapprehension. However, several Austen scholars have become convinced that the painting could have been done at the time that Jane Austen was at the age of the girl in the portrait, and that other considerations, including some paperwork related to the painting as well as the resemblance of the girl to known portraits of Austen family members, showed that it was very possible that the painting was of Jane Austen. In 2007, Henry Rice, the late owner of the painting, attempted to auction the painting through Christie’s, advertising it as the only known real portrait of Jane Austen. Unfortunately for the Rice family, buyers apparently felt the provenance of the portrait did not match the price asked, and the auction did not reach the reserve price. Another charming and completely unauthenticated piece appears in James Stanier Clarke’s “Friendship Book.” The tiny painting is of an unidentified lady, and was done about the time that Clarke met Jane Austen and conducted her on a tour of the Prince Regent’s London house. The features of the lady match those described as being Jane Austen’s: high cheekbones, high color, tall and slender. She is dressed rather fine, but no doubt Jane would have worn her best clothes, or borrowed someone else’s, for her visit to Carlton House. Also, from his surviving correspondence with Jane, it seems that Clarke was rather taken with the authoress (and who can blame him), making it perhaps more likely that he painted her in his little notebook. We’ll never know if this tiny painting is of Jane Austen, but it is fun to think it might be a remnant of Jane’s brush with greatness. Cassandra Austen’s watercolor has inspired several spinoff images. The best-known is probably the “wedding ring” engraving that was used for a book of portraits of eminent persons. Jane has been expanded into a comfortably-upholstered Victorian matron with a mild expression, complete with the bewildering addition of a wedding ring. However, she is also placed with respect as a woman of letters, surrounded by the accoutrements of her profession. Despite the inaccuracies, the image is often used as a representation of Jane Austen, probably partly because of the wonderful detail of the engraving, but also (and this is not a small consideration) because it is in the public domain! The wedding ring engraving is the last in a line of evolving “improvements” upon Cassandra’s watercolor. The first is a that was converted into an engraving to be included with the Memoir, first published in 1870. The painting certainly sweetens Jane’s expression, and perhaps contributes to the impression of many Janeites and scholars that the Memoir whitewashes Jane’s personality. At the recent Morgan library exhibition, one of the pieces displayed was a portrait by an anonymous Janeite, clearly an effort to improve upon Cassandra Austen’s watercolor. It is a delightful image and we even purchased a necklace with a charm made from it! A recent attempt to present a more finished version of Cassandra’s watercolor was done by the artist Jane Odiwe, who presented a charming Janeite fantasy of a young, pretty Jane Austen, with the round cheeks and high color described by many contemporaries as well as a delightful sparkle in her eye. Jane’s website has many other drawings of Jane Austen and her family, as well as illustrations of scenes in the novels. A photograph we’ve always enjoyed was included with an Entertainment Weekly article about the 1990s explosion of Austen film adaptations, showing Jane Austen taking a phone call on a giant cordless phone (ah, the 90s!) poolside while reading a script. The photo was updated somewhat for a more recent article on the latest set of film adaptations. 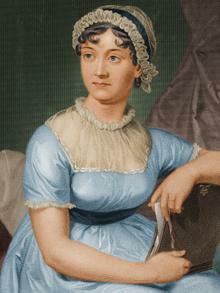 One of the recent attempts at presenting an image of Jane Austen was made by the Jane Austen Centre in Bath, which hired a forensic portraitist who worked with the existing images as well as descriptions of Jane’s appearance to present a portrait of Jane Austen as she might have looked at the time she was publishing her novels. Most Janeites of our acquaintance were not pleased with this portrait, but it serves the purpose well enough for the Bath exhibit about Jane’s life and times. We think that many Janeites are critical about the available images of Jane Austen, and strive to find or create new ones, because they are dissatisfied with what was left for us. No doubt had Jane Austen lived longer, she would have written more books, become more successful, perhaps become more of a public figure and sat for a portrait—or even sat for a portrait just for her own family. It is sad to think that the Austens just never managed to get good portraits done of their daughters. We have never felt any dissatisfaction with the existing portraits. We are rather fond of Cassandra’s watercolor, and we have a good mind-portrait of Jane Austen from reading her books and letters and the descriptions left by others. Our imagination supplies all we need. But how do we answer the simple question: What did Jane Austen look like? We can’t, really. The family members who had known Jane disagreed about the likeness of the engraving included with the Memoir; some thought it like, some thought it not like at all, some were lukewarm and reckoned it was good enough for its purpose. We have read many of the descriptions of Jane Austen and have a theory of our own. We stress that this is very much our own theory and not at all based on any scholarship, and we suspect it will not be a popular theory in some quarters. The actress Anna Chancellor, who played Caroline Bingley in P&P 1995, is descended from Jane’s brother Edward. We think she very possibly bears a family resemblance to her famous aunt. Jane was described as tall and slender, with high cheekbones and high color, and sparkling hazel eyes. We can imagine there is intelligence and humor in those eyes as well as perhaps a certain reserve. Miss Chancellor is tall and slender, with high cheekbones. She also has intelligence and humor in her expression—and while she sometimes plays unsympathetic characters, she does it so well and with so much humor that we cannot help but think she shares those traits with her famous relative. Kirkham, Margaret. “Portraits.” Jane Austen in Context, pp. 68-79. Cambridge, University Press, 2005. Le Faye, Deirdre. Jane Austen, A Family Record. Boston, G.K. Hall & Co., 1989. Thank you, Mags, for the most comprehensive and balanced consideration of the various portraits I’ve seen. Here’s my tuppence on the matter: (1) I like the Anna Chancellor suggestion–especially as I think Chancellor strongly resembles the mature portrait of Edward Knight’s eldest daughter, Fanny (the niece to whom JA wrote letters giving “agony aunt” advice). I saw the portrait of Fanny as Lady Knatchbull last summer at Chawton Cottage; several biographies of JA include reproductions of it. (2) My paperback copy of the Claire Tomalin biography gives Cassandra’s portrait of JA and the portrait of their “particular little brother,” Charles, on facing pages. Pretty strong resemblance there too, I think. She’s descended through Fanny, I think, through the Brabourne line, isn’t she? So yeah, that makes sense. Supposedly James, Henry, Jane, and Charles looked like each other, and Cassandra, Edward, and Frank looked like each other. Nobody knows about poor George, of course. A fine discussion of the topic! Much finer, I might add, than the rather irresponsible and presentation of the Rice and Clark images in the recent Shire Books Fashion in the Time of Jane Austen. One would think publishers would be more careful. Hmm, I have that book but haven’t had a chance to look it over yet. I’m not onboard with the Rice portrait being of Jane, but it is a lovely painting, and it’s been associated with Jane Austen for so long one grows to think of it as being Jane. Same with the silhouette. I guess I’m not that hung up on having a definitive image, though I do understand that other Janeites might feel frustrated. Thank you, Mags. I knew that Anna Chancellor is a descendant of Edward, but I never put the pieces together, as you have. Your theory is very logical, and I believe I will just agree with you, and think of her as the image of Jane. Good job! Anna Chancellor looks quite pretty in this picture, and I can well imagine a resemblance there. Like you I’m not hung up on a definitive image of Jane but find it interesting as all these paintings/portraits keep coming up. 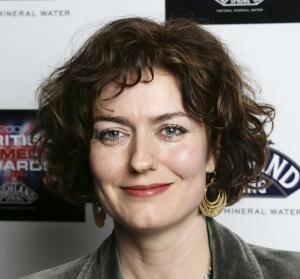 Anna Chancellor is lovely, but does she not have low cheekbones? If “high” means “prominent,” then she has high cheekbones, but if “high” means “cheekbones closer to the eye sockets,” then she has low cheekbones. I bring this up only because my dear mama congratulates herself on having produced three daughters with “high” cheekbones, but ours are of the second variety: that is, close to the eye sockets but not protruding unduly. I suspect these statements are related to age-dependent definitions of white female beauty. This is a lovely line-up of Austen images. Thank you for identifying the watercolor portrait that inspired the engraved image in the frontis piece of Jane Austen A Memoir. I had never known who created it or when. I have that info–I’ll update the article with it later. I will redirect your blog’s link to JASBRA.